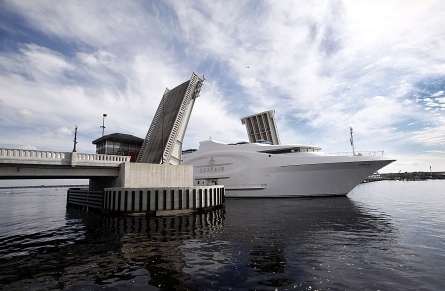 The 228 foot mega yacht SeaFair drew quite a crowd as it docked in New Bern this weekend. The yacht serves as a floating art museum and will be part of the 2012 Mumfest in downtown New Bern next weekend. SeaFair is the world’s first mobile mega yacht venue and one of the ten largest privately owned yachts in the United States. About 500 people sat in lounge chairs or lined the rails from the park to the dock at the New Bern Grand Marina. When people arrive during the Mumfest, they will find ten individual exhibit spaces and a coffee bar on the first deck; 12 exhibit spaces and the Luxe Lounge, an open-air champagne and caviar lounge on the second level aft deck; six exhibit spaces and Sapore’, the formal glass-walled restaurant, on the third deck; and Bistro360, an informal open-air restaurant and Bar360, a cocktail reception area on the sky deck. The ship will be open to the public Oct. 12 from noon to 9 p.m.; Oct. 13 from 10 a.m. to 9 p.m.; and Oct. 14 from 11 a.m. to 5 p.m. Check out http://www.expoships.com/ for tickets.